Korea and Libya have ended a months-long diplomatic dispute that was sparked by accusations of Korean spying on Libyan leader Moammar al-Qaddafi. The agreement came after Lee Sang-deuk, a brother of South Korean President Lee Myung-bak, met with the Libyan leader in Tripoli on Thursday. A Korean official told news agencies in Seoul that Qaddafi had agreed to end the "unsavory" dispute. The Yonhap news agency said Qaddafi has promised to work toward reopening Libya's de facto embassy in Seoul and releasing two South Koreans detained in Libya. 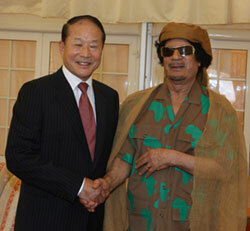 Korea and Libya built strong economic ties after establishing diplomatic relations in 1980. But relations soured after Libya expelled a Korean intelligence official for allegedly trying to collect information on Qaddafi, his family and key bureaucrats. Yonhap reported at the time that the expelled man had worked for Seoul's National Intelligence Service at its embassy in Libya. Libyan authorities shadowed him for three months before arresting and expelling him. Libya subsequently detained two Koreans on charges of violating Libya's religious laws.